Wildlife, One of Many Hiking Perks in the Smokies! Wildlife is abundant in the Smokies with over 800 square miles of forests. Taking a hike is a wonderful way to view wild animals in a natural setting while getting some exercise too. Over 66 mammal, 39 reptile, 43 amphibian, 58 fish, and over 245 bird species can be found within the park's boundaries. The Smokies is called the "Salamander Capital" with 30 species of salamanders. If you want to increase your chances of seeing wildlife, stick around near rivers and streams where they seek water. Hiking at dawn or dusk increases your chances of seeing them, since this is when they're most active. Fall and spring are good times to spot them since they mate in fall and give birth in spring. These big guys are best seen in early morning and late evening. 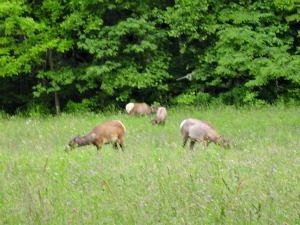 Cataloochee is a prime spot to view them since most of the elk in the park live there. There's also a small herd in the Cherokee area. Elk are bigger than any black bears you might come across in the Smokies, so keep your distance. They can charge if they feel threatened. --Only males have antlers. These antlers can weigh 40-50 lbs. and get up to 4 or 5' long. --More about antlers: Every February, the antlers fall off and new ones grow in. They're fully grown by mid-summer. Antlers are made of bone, but are soft and flexible as they grow. They're covered with soft skin (velvet) that rubs off as antlers grow and turn to bone. Each year, antlers grow bigger and have more branches. Antlers reach their maximum size when the elk is 8 or 9 years old. --They can run 30 mph for short distances. --They can make running jumps over 6' tall fences. --When frightened, elk make a snorting sound called a bark. --During mating season (fall), they make a loud call known as a bugle. --The rut is a period of fighting between male elk in the fall when they compete with each other for females. --Females give birth in May and June. Most have one calf per year. --Newborn calves have large pale spots on their backs. --Elk can live as long as 15 years. 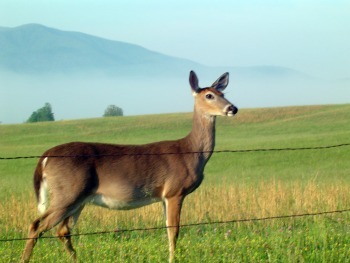 A prime place to see deer is Cades Cove. Their long tails have a white underside that stands up like a white flag when they're alarmed. --Since deer have ears on the top of their heads that can turn back and forth, they have extremely sharp hearing. --Their eyes are on the sides of their head, so it's hard to sneak up on them. --Deer can sprint up to 40 mph and jump as high as 8' at that speed. --They don't have front top teeth. While black bears are among the most-feared of all the wildlife found within the park, they can be quite elusive creatures. They really want nothing to do with us. The exception is those who have been fed. They can become less fearful of humans and be looking for a food handout. Making a lot of noise is what you want to do if you come across a curious bear. They can outrun and outclimb you. --Not all black bears are black. Most are brown with a blackish muzzle and white throat patch. --They're excellent swimmers and tree climbers. --Black bears warn other bears to keep out of their territory by posting "stay out" warnings on trees. They do this by clawing the bark on a tree while standing on their hind legs. --Females give birth in January or February every other year. They usually have 2 cubs, but may have up to 5. --Black bears can live to be 10-15 years old. or on the way up to Mount Le Conte. 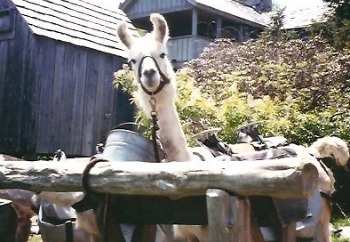 Llamas are used to carry supplies up to the lodge. The most popular route they take is the Alum Cave Trail. --Llamas are gentle and get along well with humans. They don't panic easily. However, they can kick out or spit when threatened. --They can survive several days without drinking. --A healthy, full-grown llama can carry over 100 lbs. for around 18 miles a day. --They walk on a tough, leathery sole that sticks out below their hoof. This sole doesn't slip like a hoof and makes them very sure-footed. --Llamas don't live in the wild, only as farm animals and pets. --They're able to live in high mountains where the air is very thin. Copyright © 2011 Smoky-Mountains-Hiking-Guide.com. All Rights Reserved. Please Read This Disclaimer.